Grand Champion Pen of 3 Chickens - Exhibitor: Ava Genter, daughter of Kisha & A.J. of Archbold. Buyers: Bodey Insurance, represented by Mark Bodey; Rod & Joyce Kinsman, represented by Joyce Kinsman; First Federal-Wauseon, represented by A.J. Genter; TJ Automation; and Wayne Stephens. Also pictured is Ali Genter (holding trophy), Ames & Alec Genter (holding rosettes). Reserve Champion Pen of 3 Chickens - Exhibitor: Aaron Mora, son of Martha & Fernando of Swanton. Buyer: Meijer, Inc., represented by Heather Schuster. Grand Champion Market Turkey - Exhibitor: Eli Mora, son of Martha & Fernando of Swanton. Buyer: Meyer Equipment, represented by Denny Meyer. Also pictured is Aaron Mora (holding trophy). Reserve Champion Market Turkey Exhibitor - Claire Smith, daughter of Marcene & Curt of Metamora. Buyer: Wauseon Masonic Lodge 349, represented by Trent Dominique. Horse Item, which benefits over 100 youth in 4-H horse projects. 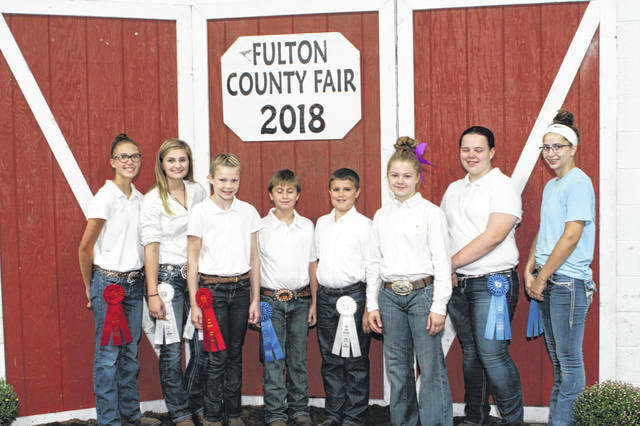 Pictured with Fulton County horse exhibitors are Allison Herr, 2018 Horse Queen (left center) and Elizabeth Beck, 2018 Jr. Fair Queen (right center) and Buyer Garth Reckner & Family, represented by Garth & Courtney Reckner (center holding plaque). Grand Champion Market Fryer Rabbit - Exhibitor: Alexa Short, daughter of Jim & Amanda of Wauseon. Buyers: Rupp Seed, represented by John King; Farmers & Merchants State Bank, represented by Scott Miller; and Pettisville Grain-Delta Feed, represented by Kurt Rychener. Reserve Champion Market Fryer Rabbit - Exhibitor: Arielle Bernal, daughter of Jennifer & Anthony of Delta. Buyer: Machacek Concrete, represented by Shawn Machacek. Grand Champion Market Roaster Rabbit - Exhibitor: Raja Burkholder, son of Jay & Megan of Wauseon. Buyers: Geringer Consulting Engineers, represented by David Geringer; and Lugbill Supply Center, represented by Dave Nafziger. Reserve Champion Market Roaster Rabbit - Exhibitor: Haiden Gombash, daughter of Ann & Joe of Swanton. Buyer: Meyer Equipment, represented by Denny Meyer. Grand Champion Market Boer Goat - Exhibitor: Wyatt Borer, son of Mindy & Adam of Archbold. Buyers: TJ Automation and A & M Welding, represented by Adam Borer; First Federal of Wauseon, represented by A.J. Genter; and Granite Industries. Reserve Champion Market Boer Goat - Exhibitor: Evan Banister, son of Chad & Kris of Wauseon. Buyers: Short Fencing, represented by Wes Short; and Countryside Animal Clinic, represented by Dr. Roger Spiess. Grand Champion Market Dairy Goat - Exhibitor: Elizabeth Pennington, daughter of Courtney & James of Swanton Buyers: Farmers & Merchants State Bank, represented by Scott Miller; Meijer, Inc., represented by Heather Schuster; Gerald Grain Center, Inc., represented by Randy Heldman; and Jones Crop Insurance, represented by Curtis Jones. Reserve Champion Market Dairy Goat - Exhibitor: Mackenzie Morgan, daughter of Heidi Klingensmith & Nathan Morgan of Wauseon. Buyers: Rupp Seed, represented by John King; and Pettisville Grain/Delta Feed, represented by Kurt Rychener. Grand Champion Dairy Feeder Calf - Exhibitor: Amberlyn Whitson, daughter of Jen of Archbold. Buyer: Sauder Manufacturing, represented by Luther Gautsche & Brenda Tolles. Also pictured is Dave Nafziger (right). Reserve Champion Dairy Feeder Calf - Exhibitor: Kennedy Keller, daughter of Alicia & Matthew of Delta. Buyer: Pettisville Grain/Delta Feed, represented by Kurt Rychener. Also pictured is Kira Keller (holding trophy). Grand Champion Beef Feeder Calf - Exhibitor: Brett Coopshaw, son of Brandon & Becky Rhodes of Wauseon. Buyers: Tri-Flo, represented by Terry Rufenacht; Rupp Seed, represented by John King; and Pettisville Grain, represented by Andrew Teet. Reserve Champion Beef Feeder Calf and Outstanding Market Beef Exhibitor - Exhibitor: Grace Schnitkey, daughter of Sheri Lechleidner & Chad Schnitkey of Wauseon. Buyer: Fulton County Cattle Feeders; Al Nofziger Family, represented by Taylor Schnitkey; Frey & Sons; and J & B Feed Co.-Wauseon & Swanton. Grand Champion Dairy Cow (Gallon of Milk) which benefits youth with dairy projects - Exhibitor: Mason Henricks, son of Phillip & Tara of Lyons. Buyers: Fulton County Dairy Association, represented by Greg Clapp, Emmons Dairy Farm, represented by Clark Emmons. Grand Champion Market Hog - Exhibitor: Ashton Dominique, daughter of Trent & Angelique of West Unity. Buyers: Butch & Sharon Frey, represented by Butch Frey; Machacek Concrete, represented by Shawn Machacek; Schaffner Equipment Repair, represented by Marty Schaffner, Cris Johnson Trucking, represented by Cris Johnson; and Schrock Farms, represented by Michael Schrock. Swine Skillathon Winners, from left, Maddie Thiel-Int. 2nd, Ashton Dominique-Sr. 3rd, Emma Krukowsk-Jr. 2nd, Tristan Flory-Jr. 1st, Kaleb Wyse-Jr. 3rd, Nevaeh Powers-Int. 3rd, Hayley Orzechowski-Int. 1st, Alex Pursel-Sr. 1st. Outstanding Market Swine Exhibitor - Exhibitor: Neveah Powers, daughter of Ryan & Amy of Fayette. OME Swine Sponsors: ShowTec Feeds, Fayette Feed Mill, and Gerald Grain Center. Outstanding Market Sheep Exhibitor - Exhibitor: Hannah Kovar, daughter of Terry & Jean of Fayette. OME Sheep Sponsor: PNC Bank, represented by Darcie Mohler and Callie Jacoby. 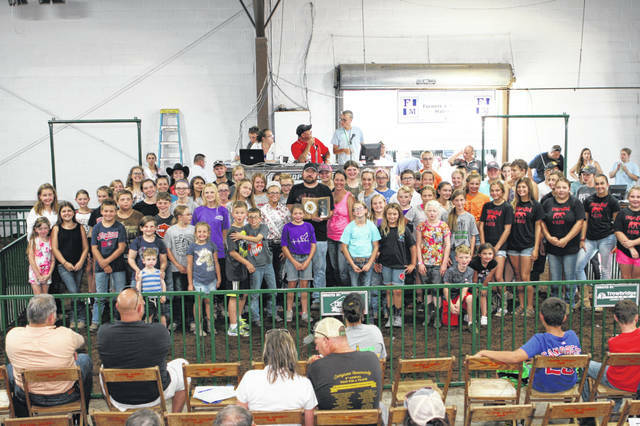 Grand Champion Market Lamb - Exhibitor: Samuel Krasula, son of Carrie & Shawn of Wauseon. Buyers: Krasula Plastering, represented by Shawn Krausula; Dawn Mahnke Blue Ribbon Diner, represented by Dawn Mahnke; Richard Goldsmith; and Hess Tool & Die. Reserve Champion Market Lamb - Exhibitor: Neveah Powers, daughter of Ryan & Amy of Fayette. Buyers: Poet Biorefining, Leipsic, represented by Mike Knueven; Davis & Kris Powers, represented by Davis Powers; and Farm Credit Mid-America, represented by Mike Evans. 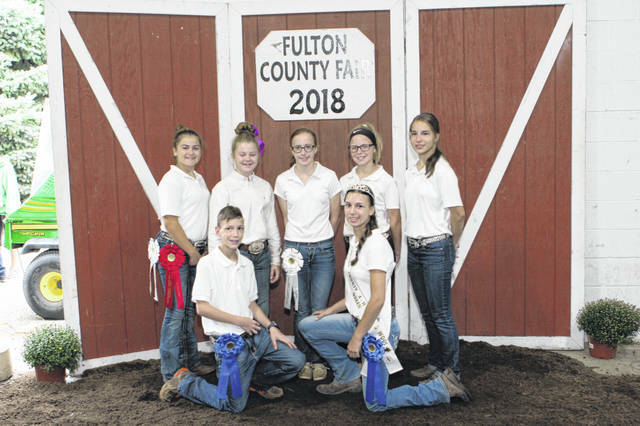 Sheep Skillathon Winners, from left, (front): Karter Zachrich-Jr. 1st & Autumn Ehrsam-Sr. 1st, (back row,L-R) Emma Vaculik-Sr. 2nd, Nevaeh Powers-Jr. 5th, Kassidy Zientek-Jr. 3rd, Janae Kinsman-Jr. 4th, Hannah Kovar-Jr. 2nd. Grand Champion Market Dairy Steer - Exhibitor: Jaden Banister, son of Troy & Jen of Wauseon. Buyers: Country Contour Landscaping and Lawns & More, represented by Troy Banister. Reserve Champion Market Dairy Steer - Exhibitor: Titus Rufenacht, son of Cory & Kylie of Archbold. Buyers: Tri-Flo, represented by Terry Rufenacht; Redline Equipment, represented by Bill Roth; Farm Credit Mid-America, represented by Tyler Keckley; Rupp Seed, represented by John King and Pettisville Grain, represented by Andrew Teet. Grand Champion Pen of 3 Chickens – Exhibitor: Ava Genter, daughter of Kisha & A.J. of Archbold. Buyers: Bodey Insurance, represented by Mark Bodey; Rod & Joyce Kinsman, represented by Joyce Kinsman; First Federal-Wauseon, represented by A.J. Genter; TJ Automation; and Wayne Stephens. Also pictured is Ali Genter (holding trophy), Ames & Alec Genter (holding rosettes). Reserve Champion Pen of 3 Chickens – Exhibitor: Aaron Mora, son of Martha & Fernando of Swanton. Buyer: Meijer, Inc., represented by Heather Schuster. Grand Champion Market Turkey – Exhibitor: Eli Mora, son of Martha & Fernando of Swanton. Buyer: Meyer Equipment, represented by Denny Meyer. Also pictured is Aaron Mora (holding trophy). Reserve Champion Market Turkey Exhibitor – Claire Smith, daughter of Marcene & Curt of Metamora. Buyer: Wauseon Masonic Lodge 349, represented by Trent Dominique. 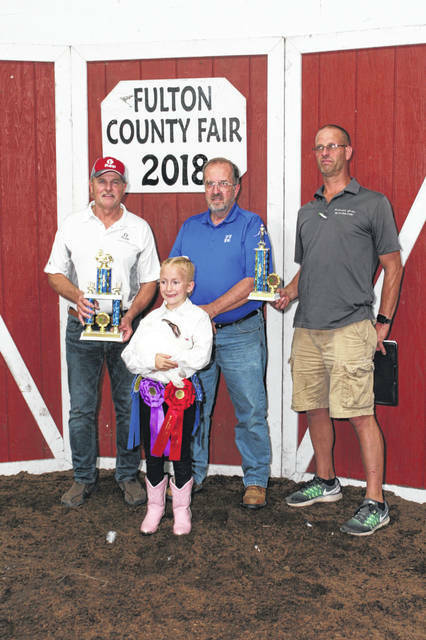 Grand Champion Market Fryer Rabbit – Exhibitor: Alexa Short, daughter of Jim & Amanda of Wauseon. Buyers: Rupp Seed, represented by John King; Farmers & Merchants State Bank, represented by Scott Miller; and Pettisville Grain-Delta Feed, represented by Kurt Rychener. Reserve Champion Market Fryer Rabbit – Exhibitor: Arielle Bernal, daughter of Jennifer & Anthony of Delta. Buyer: Machacek Concrete, represented by Shawn Machacek. Grand Champion Market Roaster Rabbit – Exhibitor: Raja Burkholder, son of Jay & Megan of Wauseon. Buyers: Geringer Consulting Engineers, represented by David Geringer; and Lugbill Supply Center, represented by Dave Nafziger. Reserve Champion Market Roaster Rabbit – Exhibitor: Haiden Gombash, daughter of Ann & Joe of Swanton. Buyer: Meyer Equipment, represented by Denny Meyer. Grand Champion Market Boer Goat – Exhibitor: Wyatt Borer, son of Mindy & Adam of Archbold. Buyers: TJ Automation and A & M Welding, represented by Adam Borer; First Federal of Wauseon, represented by A.J. Genter; and Granite Industries. Reserve Champion Market Boer Goat – Exhibitor: Evan Banister, son of Chad & Kris of Wauseon. Buyers: Short Fencing, represented by Wes Short; and Countryside Animal Clinic, represented by Dr. Roger Spiess. Grand Champion Market Dairy Goat – Exhibitor: Elizabeth Pennington, daughter of Courtney & James of Swanton Buyers: Farmers & Merchants State Bank, represented by Scott Miller; Meijer, Inc., represented by Heather Schuster; Gerald Grain Center, Inc., represented by Randy Heldman; and Jones Crop Insurance, represented by Curtis Jones. Reserve Champion Market Dairy Goat – Exhibitor: Mackenzie Morgan, daughter of Heidi Klingensmith & Nathan Morgan of Wauseon. Buyers: Rupp Seed, represented by John King; and Pettisville Grain/Delta Feed, represented by Kurt Rychener. Grand Champion Dairy Feeder Calf – Exhibitor: Amberlyn Whitson, daughter of Jen of Archbold. Buyer: Sauder Manufacturing, represented by Luther Gautsche & Brenda Tolles. Also pictured is Dave Nafziger (right). Reserve Champion Dairy Feeder Calf – Exhibitor: Kennedy Keller, daughter of Alicia & Matthew of Delta. Buyer: Pettisville Grain/Delta Feed, represented by Kurt Rychener. Also pictured is Kira Keller (holding trophy). Grand Champion Beef Feeder Calf – Exhibitor: Brett Coopshaw, son of Brandon & Becky Rhodes of Wauseon. Buyers: Tri-Flo, represented by Terry Rufenacht; Rupp Seed, represented by John King; and Pettisville Grain, represented by Andrew Teet. Reserve Champion Beef Feeder Calf and Outstanding Market Beef Exhibitor – Exhibitor: Grace Schnitkey, daughter of Sheri Lechleidner & Chad Schnitkey of Wauseon. Buyer: Fulton County Cattle Feeders; Al Nofziger Family, represented by Taylor Schnitkey; Frey & Sons; and J & B Feed Co.-Wauseon & Swanton. Grand Champion Dairy Cow (Gallon of Milk) which benefits youth with dairy projects – Exhibitor: Mason Henricks, son of Phillip & Tara of Lyons. Buyers: Fulton County Dairy Association, represented by Greg Clapp, Emmons Dairy Farm, represented by Clark Emmons. Grand Champion Market Hog – Exhibitor: Ashton Dominique, daughter of Trent & Angelique of West Unity. Buyers: Butch & Sharon Frey, represented by Butch Frey; Machacek Concrete, represented by Shawn Machacek; Schaffner Equipment Repair, represented by Marty Schaffner, Cris Johnson Trucking, represented by Cris Johnson; and Schrock Farms, represented by Michael Schrock. 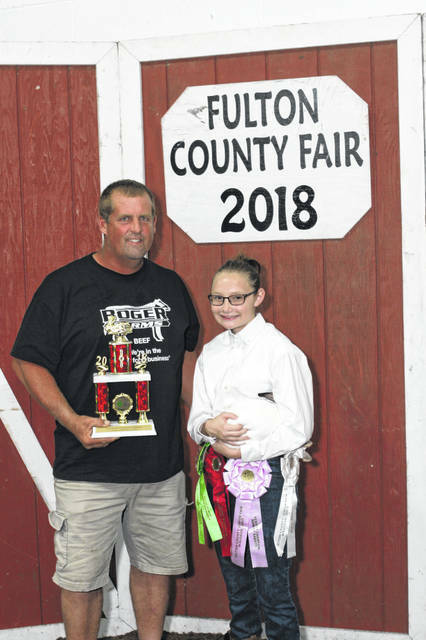 Outstanding Market Swine Exhibitor – Exhibitor: Neveah Powers, daughter of Ryan & Amy of Fayette. OME Swine Sponsors: ShowTec Feeds, Fayette Feed Mill, and Gerald Grain Center. 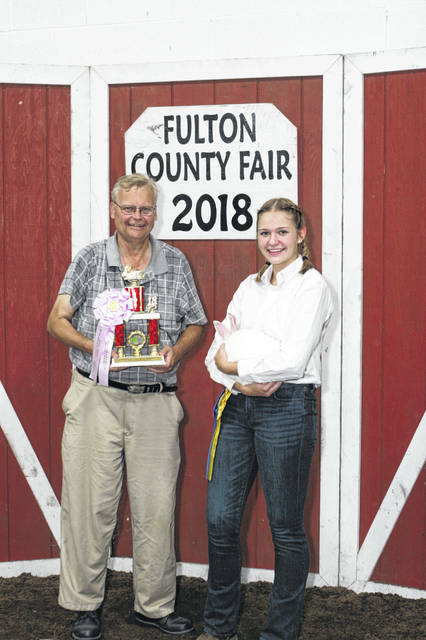 Outstanding Market Sheep Exhibitor – Exhibitor: Hannah Kovar, daughter of Terry & Jean of Fayette. OME Sheep Sponsor: PNC Bank, represented by Darcie Mohler and Callie Jacoby. Grand Champion Market Lamb – Exhibitor: Samuel Krasula, son of Carrie & Shawn of Wauseon. Buyers: Krasula Plastering, represented by Shawn Krausula; Dawn Mahnke Blue Ribbon Diner, represented by Dawn Mahnke; Richard Goldsmith; and Hess Tool & Die. Reserve Champion Market Lamb – Exhibitor: Neveah Powers, daughter of Ryan & Amy of Fayette. Buyers: Poet Biorefining, Leipsic, represented by Mike Knueven; Davis & Kris Powers, represented by Davis Powers; and Farm Credit Mid-America, represented by Mike Evans. Grand Champion Market Dairy Steer – Exhibitor: Jaden Banister, son of Troy & Jen of Wauseon. Buyers: Country Contour Landscaping and Lawns & More, represented by Troy Banister. Reserve Champion Market Dairy Steer – Exhibitor: Titus Rufenacht, son of Cory & Kylie of Archbold. Buyers: Tri-Flo, represented by Terry Rufenacht; Redline Equipment, represented by Bill Roth; Farm Credit Mid-America, represented by Tyler Keckley; Rupp Seed, represented by John King and Pettisville Grain, represented by Andrew Teet. Grand Champion Market Beef Steer – Exhibitor: Adam Kinsman, son of Joyce & Rod of Archbold. Buyers: MDK Transport, LLC, represented by Mert Kinsman; Meijer, Inc., represented by Heather Schuster; Fulton County Processing; and First Federal-Wauseon, represented by A.J. Genter; Frey & Sons; S & W Alfalfa Mill; and Hit Trophy, Inc. Also pictured is Jenae Kinsman (holding trophy and rosette). Grand Champion Born & Raised Market Beef Steer – Exhibitor: Allison Herr, daughter of Tommy & Jenny of Metamora. Buyers: Jones & Follmer Insurance, represented by Curt Jones; Precision Ag Services, represented by Bill Copeland, Poet Biorefining, Leipsic, represented by Mike Knueven; Falor Farm Center, represented by Jared Burkholder; Gerald Grain Center, Inc., represented by Clark Carroll Also pictured is Hannah Kovar (holding trophies). Reserve Champion Born & Raised Market Beef Steer – Exhibitor: Lynnsey Crouch, daughter of Jeremy & Kimberly of Wauseon. Buyers: Terry Henricks Auto Group, represented by Doug Rupp; Farm Credit Mid-America, represented by Tyler Keckley; and Fulton County Cattle Feeders. Beef Skillathon Winners, from left, Neveah Powers-Jr. 1st, Allison Herr-Sr 2nd, Hannah Kovar-Jr. 2nd. 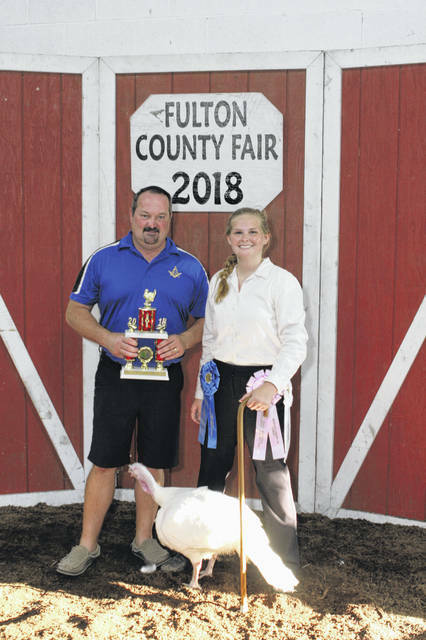 https://www.fcnews.org/wp-content/uploads/sites/45/2018/09/web1_IMG_0001.jpgGrand Champion Pen of 3 Chickens – Exhibitor: Ava Genter, daughter of Kisha & A.J. of Archbold. Buyers: Bodey Insurance, represented by Mark Bodey; Rod & Joyce Kinsman, represented by Joyce Kinsman; First Federal-Wauseon, represented by A.J. Genter; TJ Automation; and Wayne Stephens. Also pictured is Ali Genter (holding trophy), Ames & Alec Genter (holding rosettes). 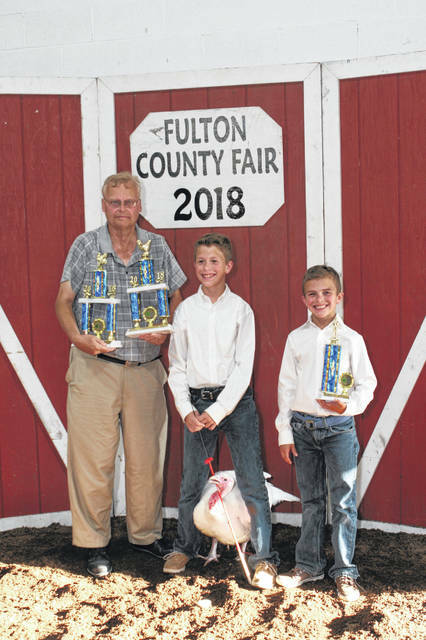 https://www.fcnews.org/wp-content/uploads/sites/45/2018/09/web1_IMG_0003.jpgReserve Champion Pen of 3 Chickens – Exhibitor: Aaron Mora, son of Martha & Fernando of Swanton. Buyer: Meijer, Inc., represented by Heather Schuster. https://www.fcnews.org/wp-content/uploads/sites/45/2018/09/web1_IMG_0004.jpgGrand Champion Market Turkey – Exhibitor: Eli Mora, son of Martha & Fernando of Swanton. Buyer: Meyer Equipment, represented by Denny Meyer. Also pictured is Aaron Mora (holding trophy). 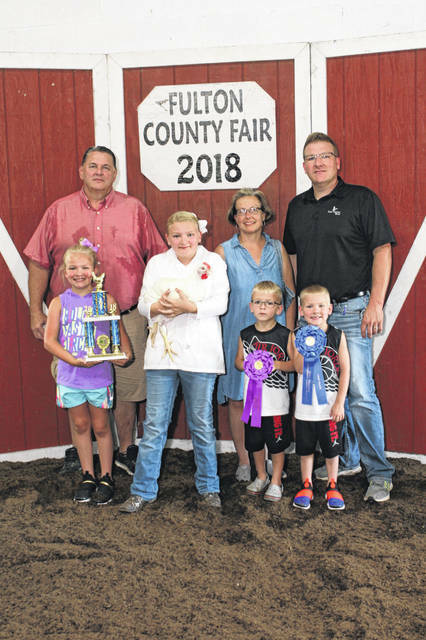 https://www.fcnews.org/wp-content/uploads/sites/45/2018/09/web1_IMG_0005.jpgReserve Champion Market Turkey Exhibitor – Claire Smith, daughter of Marcene & Curt of Metamora. Buyer: Wauseon Masonic Lodge 349, represented by Trent Dominique. https://www.fcnews.org/wp-content/uploads/sites/45/2018/09/web1_IMG_0007.jpgHorse Item, which benefits over 100 youth in 4-H horse projects. Pictured with Fulton County horse exhibitors are Allison Herr, 2018 Horse Queen (left center) and Elizabeth Beck, 2018 Jr. Fair Queen (right center) and Buyer Garth Reckner & Family, represented by Garth & Courtney Reckner (center holding plaque). 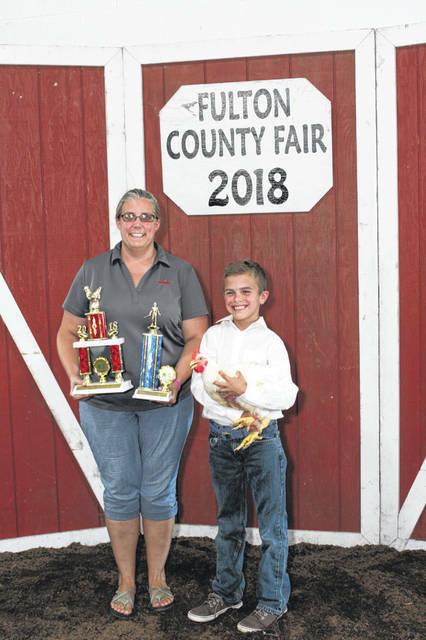 https://www.fcnews.org/wp-content/uploads/sites/45/2018/09/web1_IMG_0008.jpgGrand Champion Market Fryer Rabbit – Exhibitor: Alexa Short, daughter of Jim & Amanda of Wauseon. Buyers: Rupp Seed, represented by John King; Farmers & Merchants State Bank, represented by Scott Miller; and Pettisville Grain-Delta Feed, represented by Kurt Rychener. https://www.fcnews.org/wp-content/uploads/sites/45/2018/09/web1_IMG_0009.jpgReserve Champion Market Fryer Rabbit – Exhibitor: Arielle Bernal, daughter of Jennifer & Anthony of Delta. Buyer: Machacek Concrete, represented by Shawn Machacek. 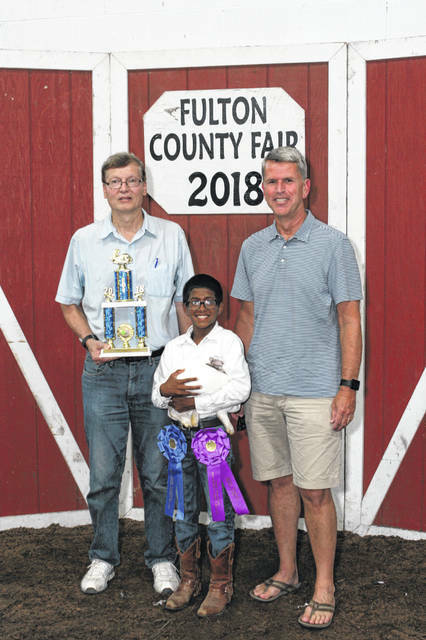 https://www.fcnews.org/wp-content/uploads/sites/45/2018/09/web1_IMG_0010.jpgGrand Champion Market Roaster Rabbit – Exhibitor: Raja Burkholder, son of Jay & Megan of Wauseon. Buyers: Geringer Consulting Engineers, represented by David Geringer; and Lugbill Supply Center, represented by Dave Nafziger. https://www.fcnews.org/wp-content/uploads/sites/45/2018/09/web1_IMG_0011.jpgReserve Champion Market Roaster Rabbit – Exhibitor: Haiden Gombash, daughter of Ann & Joe of Swanton. Buyer: Meyer Equipment, represented by Denny Meyer. 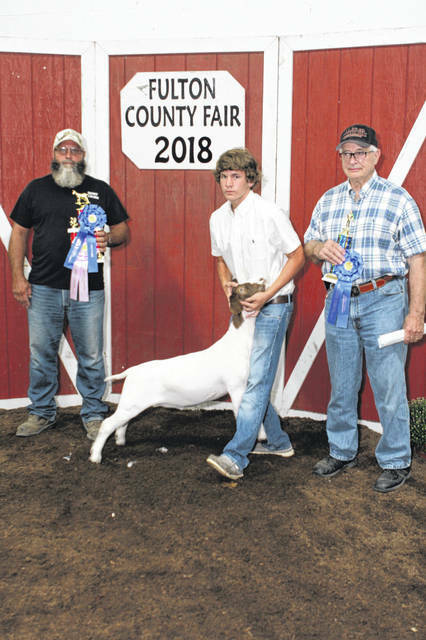 https://www.fcnews.org/wp-content/uploads/sites/45/2018/09/web1_IMG_0012.jpgGrand Champion Market Boer Goat – Exhibitor: Wyatt Borer, son of Mindy & Adam of Archbold. Buyers: TJ Automation and A & M Welding, represented by Adam Borer; First Federal of Wauseon, represented by A.J. Genter; and Granite Industries. 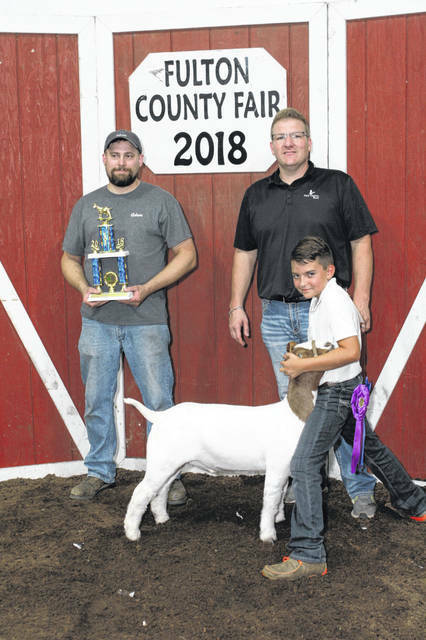 https://www.fcnews.org/wp-content/uploads/sites/45/2018/09/web1_IMG_0013.jpgReserve Champion Market Boer Goat – Exhibitor: Evan Banister, son of Chad & Kris of Wauseon. Buyers: Short Fencing, represented by Wes Short; and Countryside Animal Clinic, represented by Dr. Roger Spiess. 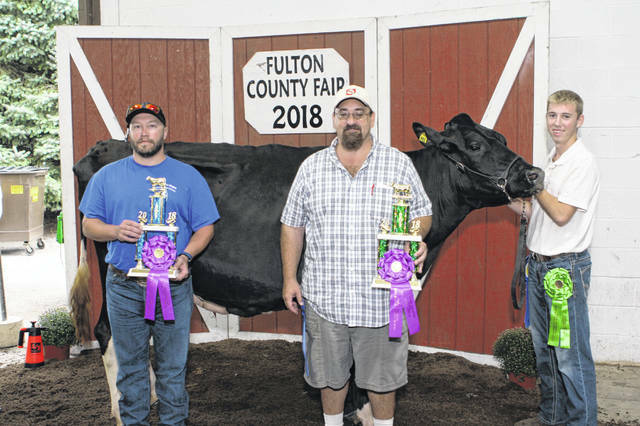 https://www.fcnews.org/wp-content/uploads/sites/45/2018/09/web1_IMG_0014.jpgGrand Champion Market Dairy Goat – Exhibitor: Elizabeth Pennington, daughter of Courtney & James of Swanton Buyers: Farmers & Merchants State Bank, represented by Scott Miller; Meijer, Inc., represented by Heather Schuster; Gerald Grain Center, Inc., represented by Randy Heldman; and Jones Crop Insurance, represented by Curtis Jones. 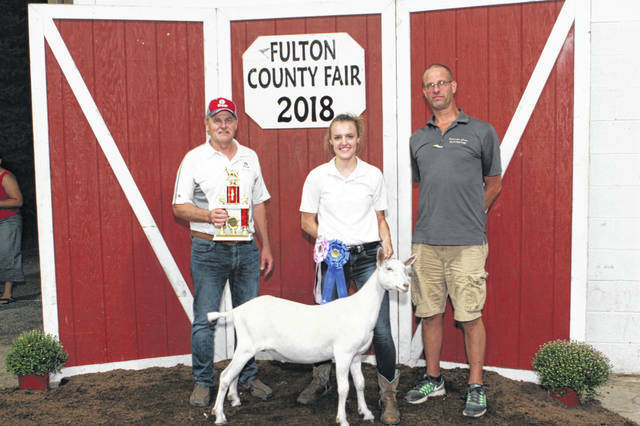 https://www.fcnews.org/wp-content/uploads/sites/45/2018/09/web1_IMG_0015.jpgReserve Champion Market Dairy Goat – Exhibitor: Mackenzie Morgan, daughter of Heidi Klingensmith & Nathan Morgan of Wauseon. Buyers: Rupp Seed, represented by John King; and Pettisville Grain/Delta Feed, represented by Kurt Rychener. 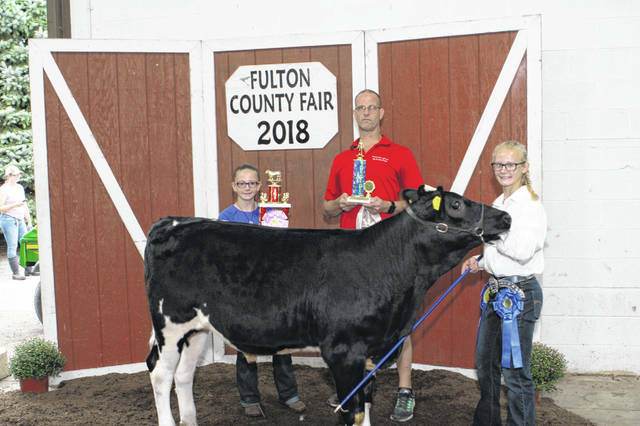 https://www.fcnews.org/wp-content/uploads/sites/45/2018/09/web1_IMG_0016.jpgGrand Champion Dairy Feeder Calf – Exhibitor: Amberlyn Whitson, daughter of Jen of Archbold. Buyer: Sauder Manufacturing, represented by Luther Gautsche & Brenda Tolles. Also pictured is Dave Nafziger (right). 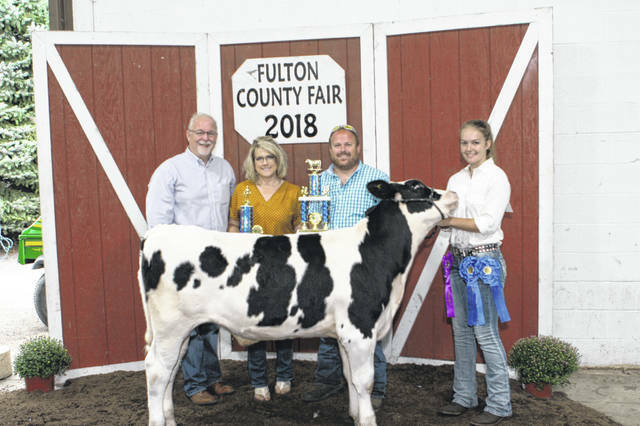 https://www.fcnews.org/wp-content/uploads/sites/45/2018/09/web1_IMG_0017.jpgReserve Champion Dairy Feeder Calf – Exhibitor: Kennedy Keller, daughter of Alicia & Matthew of Delta. Buyer: Pettisville Grain/Delta Feed, represented by Kurt Rychener. Also pictured is Kira Keller (holding trophy). 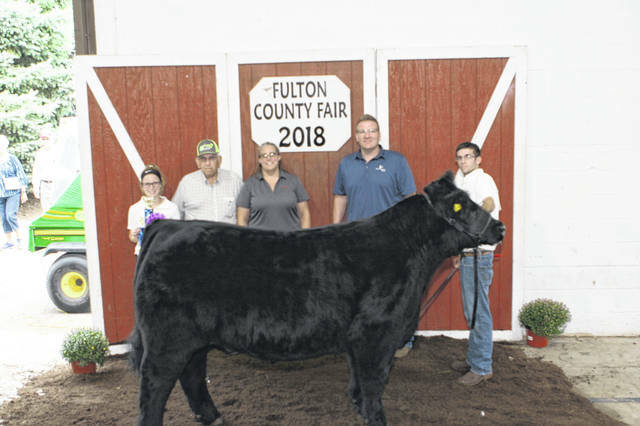 https://www.fcnews.org/wp-content/uploads/sites/45/2018/09/web1_IMG_0018.jpgGrand Champion Beef Feeder Calf – Exhibitor: Brett Coopshaw, son of Brandon & Becky Rhodes of Wauseon. Buyers: Tri-Flo, represented by Terry Rufenacht; Rupp Seed, represented by John King; and Pettisville Grain, represented by Andrew Teet. 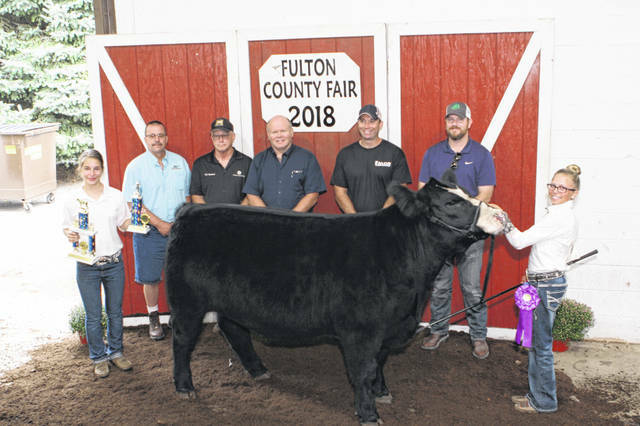 https://www.fcnews.org/wp-content/uploads/sites/45/2018/09/web1_IMG_0019.jpgReserve Champion Beef Feeder Calf and Outstanding Market Beef Exhibitor – Exhibitor: Grace Schnitkey, daughter of Sheri Lechleidner & Chad Schnitkey of Wauseon. Buyer: Fulton County Cattle Feeders; Al Nofziger Family, represented by Taylor Schnitkey; Frey & Sons; and J & B Feed Co.-Wauseon & Swanton. 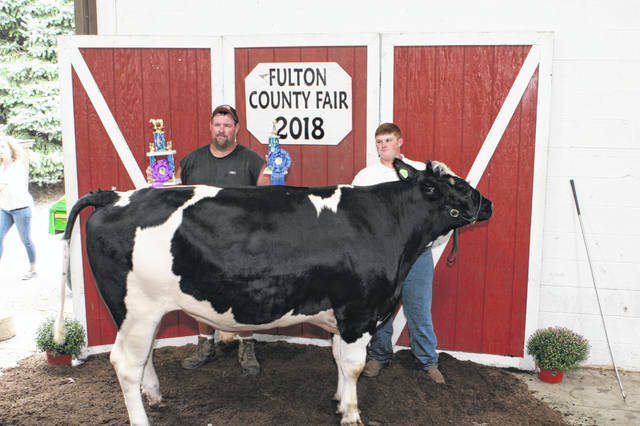 https://www.fcnews.org/wp-content/uploads/sites/45/2018/09/web1_IMG_0020.jpgGrand Champion Dairy Cow (Gallon of Milk) which benefits youth with dairy projects – Exhibitor: Mason Henricks, son of Phillip & Tara of Lyons. Buyers: Fulton County Dairy Association, represented by Greg Clapp, Emmons Dairy Farm, represented by Clark Emmons. 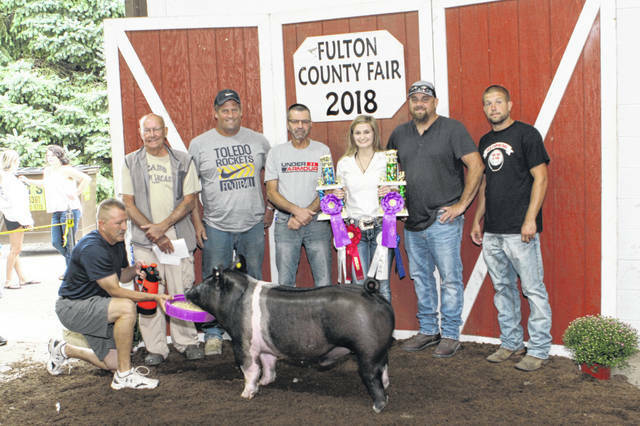 https://www.fcnews.org/wp-content/uploads/sites/45/2018/09/web1_IMG_0021.jpgGrand Champion Market Hog – Exhibitor: Ashton Dominique, daughter of Trent & Angelique of West Unity. Buyers: Butch & Sharon Frey, represented by Butch Frey; Machacek Concrete, represented by Shawn Machacek; Schaffner Equipment Repair, represented by Marty Schaffner, Cris Johnson Trucking, represented by Cris Johnson; and Schrock Farms, represented by Michael Schrock. https://www.fcnews.org/wp-content/uploads/sites/45/2018/09/web1_IMG_0022.jpgSwine Skillathon Winners, from left, Maddie Thiel-Int. 2nd, Ashton Dominique-Sr. 3rd, Emma Krukowsk-Jr. 2nd, Tristan Flory-Jr. 1st, Kaleb Wyse-Jr. 3rd, Nevaeh Powers-Int. 3rd, Hayley Orzechowski-Int. 1st, Alex Pursel-Sr. 1st. 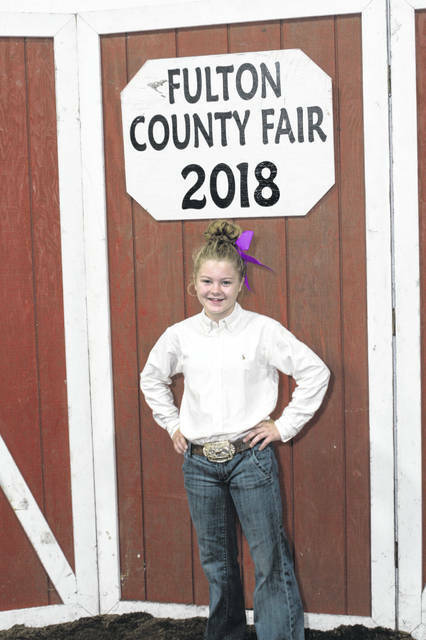 https://www.fcnews.org/wp-content/uploads/sites/45/2018/09/web1_IMG_0023.jpgOutstanding Market Swine Exhibitor – Exhibitor: Neveah Powers, daughter of Ryan & Amy of Fayette. OME Swine Sponsors: ShowTec Feeds, Fayette Feed Mill, and Gerald Grain Center. 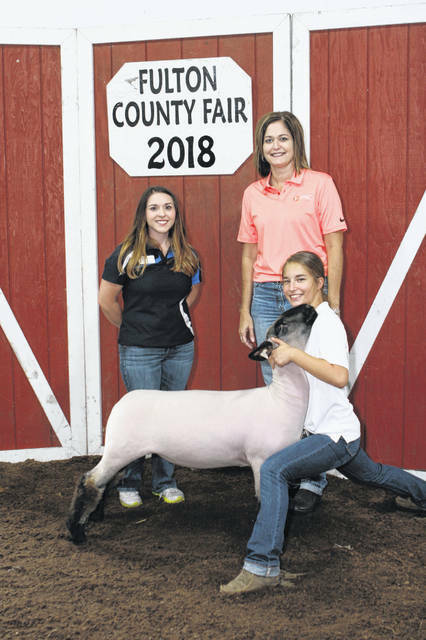 https://www.fcnews.org/wp-content/uploads/sites/45/2018/09/web1_IMG_0024.jpgOutstanding Market Sheep Exhibitor – Exhibitor: Hannah Kovar, daughter of Terry & Jean of Fayette. OME Sheep Sponsor: PNC Bank, represented by Darcie Mohler and Callie Jacoby. 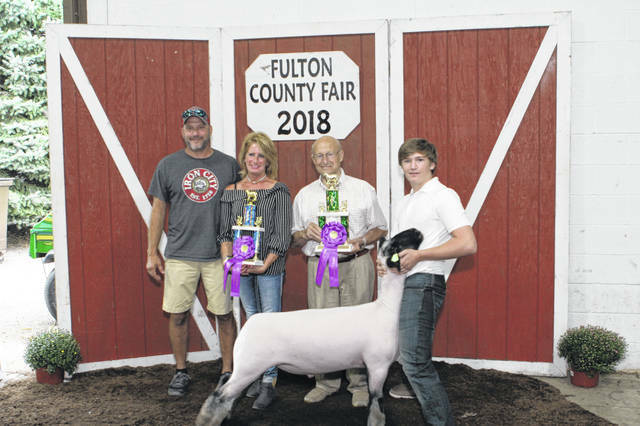 https://www.fcnews.org/wp-content/uploads/sites/45/2018/09/web1_IMG_0025.jpgGrand Champion Market Lamb – Exhibitor: Samuel Krasula, son of Carrie & Shawn of Wauseon. Buyers: Krasula Plastering, represented by Shawn Krausula; Dawn Mahnke Blue Ribbon Diner, represented by Dawn Mahnke; Richard Goldsmith; and Hess Tool & Die. 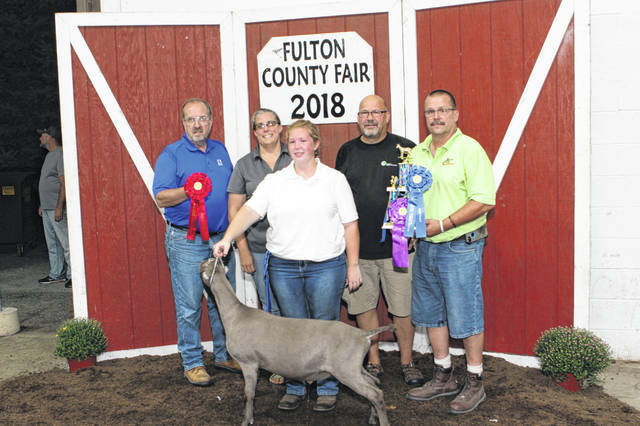 https://www.fcnews.org/wp-content/uploads/sites/45/2018/09/web1_IMG_0026.jpgReserve Champion Market Lamb – Exhibitor: Neveah Powers, daughter of Ryan & Amy of Fayette. Buyers: Poet Biorefining, Leipsic, represented by Mike Knueven; Davis & Kris Powers, represented by Davis Powers; and Farm Credit Mid-America, represented by Mike Evans. 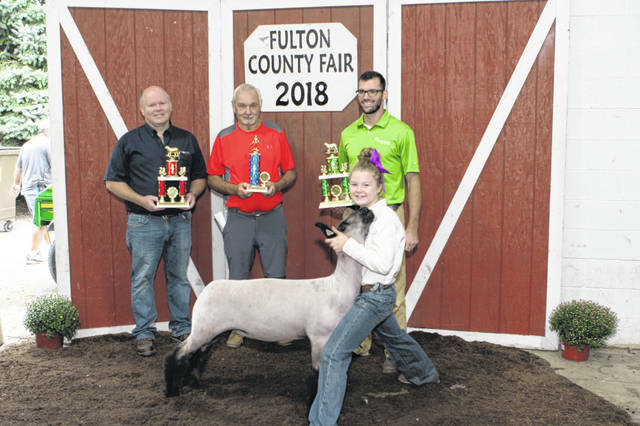 https://www.fcnews.org/wp-content/uploads/sites/45/2018/09/web1_IMG_0027.jpgSheep Skillathon Winners, from left, (front): Karter Zachrich-Jr. 1st & Autumn Ehrsam-Sr. 1st, (back row,L-R) Emma Vaculik-Sr. 2nd, Nevaeh Powers-Jr. 5th, Kassidy Zientek-Jr. 3rd, Janae Kinsman-Jr. 4th, Hannah Kovar-Jr. 2nd. 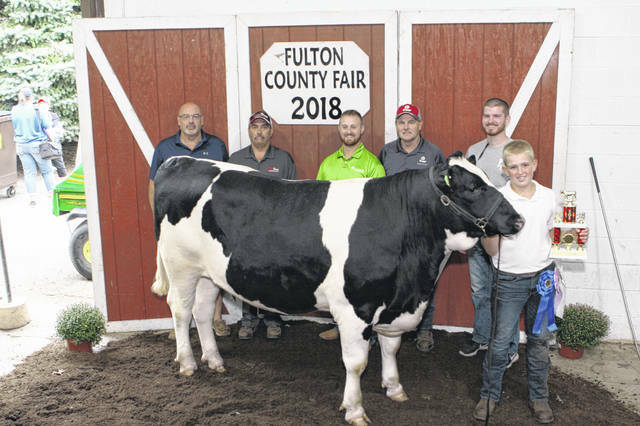 https://www.fcnews.org/wp-content/uploads/sites/45/2018/09/web1_IMG_0028.jpgGrand Champion Market Dairy Steer – Exhibitor: Jaden Banister, son of Troy & Jen of Wauseon. Buyers: Country Contour Landscaping and Lawns & More, represented by Troy Banister. 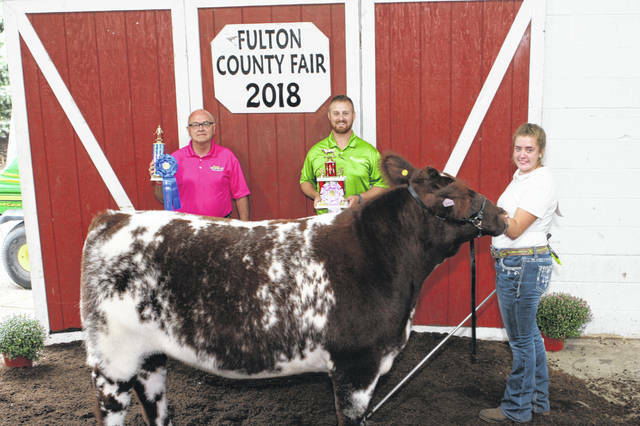 https://www.fcnews.org/wp-content/uploads/sites/45/2018/09/web1_IMG_0029.jpgReserve Champion Market Dairy Steer – Exhibitor: Titus Rufenacht, son of Cory & Kylie of Archbold. Buyers: Tri-Flo, represented by Terry Rufenacht; Redline Equipment, represented by Bill Roth; Farm Credit Mid-America, represented by Tyler Keckley; Rupp Seed, represented by John King and Pettisville Grain, represented by Andrew Teet. 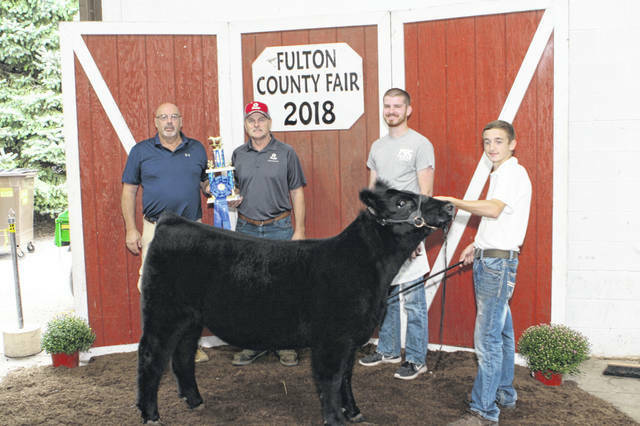 https://www.fcnews.org/wp-content/uploads/sites/45/2018/09/web1_IMG_0030.jpgGrand Champion Market Beef Steer – Exhibitor: Adam Kinsman, son of Joyce & Rod of Archbold. Buyers: MDK Transport, LLC, represented by Mert Kinsman; Meijer, Inc., represented by Heather Schuster; Fulton County Processing; and First Federal-Wauseon, represented by A.J. Genter; Frey & Sons; S & W Alfalfa Mill; and Hit Trophy, Inc. Also pictured is Jenae Kinsman (holding trophy and rosette). 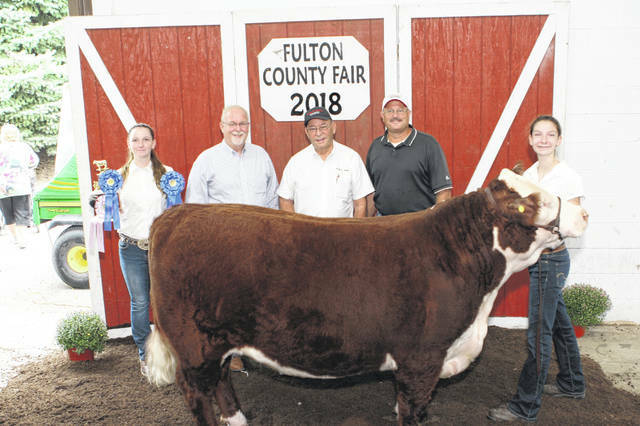 https://www.fcnews.org/wp-content/uploads/sites/45/2018/09/web1_IMG_0033.jpgGrand Champion Born & Raised Market Beef Steer – Exhibitor: Allison Herr, daughter of Tommy & Jenny of Metamora. Buyers: Jones & Follmer Insurance, represented by Curt Jones; Precision Ag Services, represented by Bill Copeland, Poet Biorefining, Leipsic, represented by Mike Knueven; Falor Farm Center, represented by Jared Burkholder; Gerald Grain Center, Inc., represented by Clark Carroll Also pictured is Hannah Kovar (holding trophies). 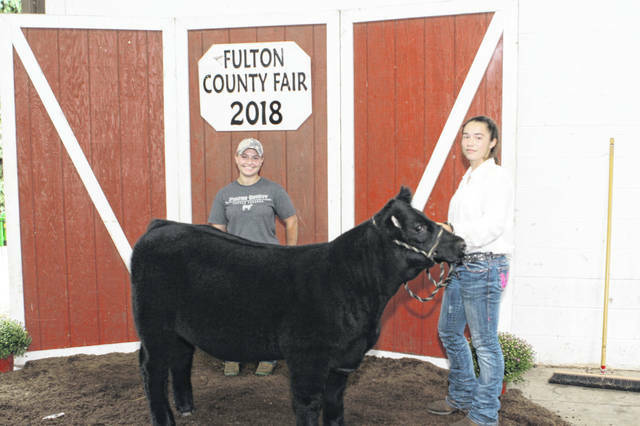 https://www.fcnews.org/wp-content/uploads/sites/45/2018/09/web1_IMG_0035.jpgReserve Champion Born & Raised Market Beef Steer – Exhibitor: Lynnsey Crouch, daughter of Jeremy & Kimberly of Wauseon. Buyers: Terry Henricks Auto Group, represented by Doug Rupp; Farm Credit Mid-America, represented by Tyler Keckley; and Fulton County Cattle Feeders. 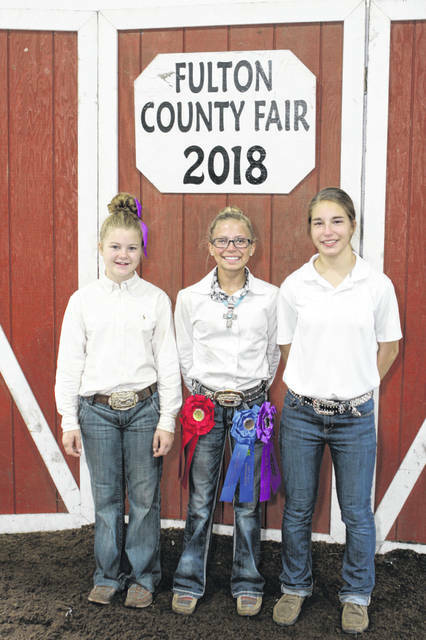 https://www.fcnews.org/wp-content/uploads/sites/45/2018/09/web1_IMG_0036.jpgBeef Skillathon Winners, from left, Neveah Powers-Jr. 1st, Allison Herr-Sr 2nd, Hannah Kovar-Jr. 2nd.